McCloud, California - An invigorating day along a McCloud River trail after a tranquil morning spent casting flies to receptive trout. A mid-afternoon respite in the cozy, relaxing room of our McCloud Stoney Brook Inn accommodations. We dress Western, the evenings theme, and board the Shasta Dinner Train for a wonderful four-hour dinner excursion steeped in refinement, camaraderie, and visual stimulation of the bygone days of elegant train travel come alive again. All of this we do along the apron hem of America's most revered volcano, Mount Shasta in Northern California. It has no less an allure than Japan's Fuji, Africa's Kilimanjaro, or Switzerland's Matterhorn. 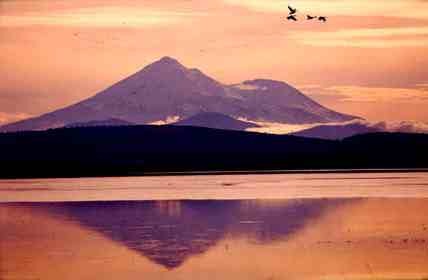 Though it has slightly less elevation (14,162 feet) than Washington's Mount Rainer (14,410 feet), Shasta looms larger because it rises from a lower plain. At 80 cubic miles of volume, it is the largest volcano in the United States. Many people worldwide, including Native American tribes who still hold ceremonies along its slopes, hold this fabled mountain sacred. It was the site of the Tibetan Fire Ceremony in 1989, and a gathering point in 1987 for the Harmonic Convergence Conference. Shasta is a mountain of extravagant beauty and many moods. It dominates the landscape in Northern California and parts of Southern Oregon. As a recreation destination, Mount Shasta and environs offer immense diversity for adventure. Close proximity allows robust days of multiple activities, although it is often more reasonable to focus on one. Four small towns lie at the foot of Mount Shasta. Here's where the adventure begins. McCloud has an air of remoteness, but it can be easily reached, lying nine miles east on Highway 89 from Interstate 5. It is one of California's newest resort destinations, resurrected from the smoldering ashes of a demised timber industry. This historic mill town is fascinating with its boardwalks and turn of the century architecture. The McCloud Lumber Company owned the entire town and made it self-sufficient starting in 1890, including establishing a dairy, hospital and power plant. In the 1960s the town became privatized. In the earlier years, the McCloud area became a secret retreat for the wealthy and famous, among them Jean Harlow, Herbert Hoover and the Randolph Hearst family, who still own a retreat along the McCloud River. In the last ten years, McCloud has experienced a tourist bonanza. Old lumber office buildings, residences, and hotels have been restored into beautiful, charming bed and breakfast inns. 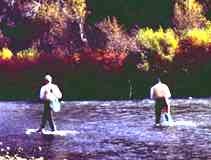 Nearby McCloud River is a world class fishery for trout. It is the only fishery in California that supports the rare Dolly Varden trout. The river is home to several stunning waterfalls, two of which provide great diving and swimming pools for the intrepid. Hiking trails abound throughout this region. The centerpiece of McCloud is the McCloud Railway. Dedicated to strictly lumber freight in the past, the railway has added open air excursion rides through the forested slopes on the south and east side of Mount Shasta in diesel locomotives, and, on occasion, the historic 1925 steam locomotive McCloud River Railway No. 25. 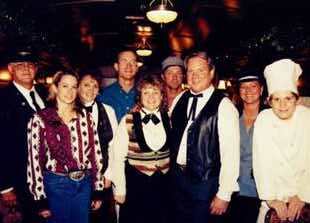 Whereas the open-air ride is the facet, the gem is the Shasta Sunset Dinner Train. A gourmet menu and wines in an elegant setting await the traveler. 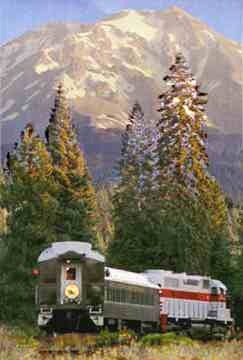 Katherine Verlirdy, San Francisco, was glowing as the train chugged toward the city of Mount Shasta, "Lovely, lovely. I love all the wonderful details. Sumptuous food and wine. Great entertainment." Shasta Dinner Train owners, engineer, and crew Strolling cowboy minstrel Ronnie Brackett serenaded us with country, folk, and old range songs. Thursday Theme Nights extend throughout the summer and include Western, Motown Night, Mystery Train, Melodrama Night, Big Band Night, 50's Sock Hop, Western Night and Disco Night. The four dining cars have a rich interior of mahogany and brass with a deep "Pullman Green" and gold exterior finish. There is an open-air car where guests can enjoy sweeping views of the valleys below, Mount Shasta above, and distant Mount Lassen. As the train huffs and puffs, smells of pine, cedar, spruce, and fir fill the air. Mount Shasta City, located along Interstate 5, is the gateway to regal Mount Shasta. Mountain climbers generally meet here before ascending the mystic mountain. Everitt Memorial Highway, open year round, begins in Shasta City and takes travelers up to the 6,900-foot level, the most frequently used starting point for climbers. This area is also used for winter snow sports. Shasta has California's largest glacier, the Whitney Glacier. There are numerous routes to the summits, most of which are considered technical climbs requiring special equipment and ability. My climbs have always been with a walking staff and a good pair of Danner hiking boots. Its also recommended to carry an ice axe and crampons to traverse hard snow and ice fields. Plan eight to ten hours for the strenuous outing. You will be rewarded with spectacular views. On the clearest days you may even be able to make out the Pacific Ocean. Nearby Mount Shasta Ski Park, located halfway between Shasta City and McCloud, is a year-round playground. 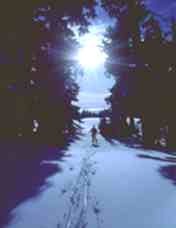 Downhill skiing takes place from November through mid-Spring, and includes night skiing. The Park is equally vibrant in the summer months with a climbing tower, mountain biking, scenic chairlift rides, and concerts. The summer season ends Labor Day, with a blues festival and barbecue. The annual Microbrewery Festival is hosted the prior weekend each year. Shasta Valley Balloon Those who do not wish to attack the summit can have adventurous outings with day hikes around and near Mount Shasta. Mount Shastina Trail, Black Butte Trail and Castle Lake Trail fit that bill. Alternatively, an unforgettable view of Mount Shasta is via the transport of a hot air balloon. Shasta Valley Balloons operates daily trips in the beautiful Shasta Valley north of Mount Shasta. Then, unwind at the end of the day at one of Shasta City's luxury resorts, charming bed and breakfast inns, motels, or around the campfire at your own campsite. I had driven by Dunsmuir for nearly 30 years before stopping for a visit last year. I am now shaking my head wondering why I waited so long. Nestled in the tree-covered Upper Sacramento River canyon, it is one of Northern California's last unspoiled mountain towns. It lies south of Mount Shasta City, beside Interstate 5. Waiting around each bend of this verdant canyon are adventures. Hike to the uniquely beautiful moss and fern covered Mossbrae Falls, experience a thrilling raft ride on the Upper Sacramento River, hike up into the rock crags of Castle Crags State Park, or fly fish the famous Sacramento River. 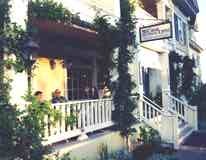 Spend an early evening in quaint Caf� Maddalena. For dinner I prefer Maddy's outdoor garden, where the owner and chef, Maddy, will transport your palette to the finer zones of Italian cuisine with Mediterranean flair. After dinner, mosey up the hill to the historic California Theatres (1925), showing the latest movies in three unique theaters, all with era settings. Don't forget to tour the 10-acre Dunsmuir Botanical Gardens, with a special garden designed to attract hummingbirds and butterflies. Browntrout Gallery in the old town railroad district is another must-see attraction. 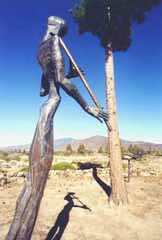 Located where Highway 97 intersects Interstate 5, Weed lies at the bottom of Shasta's west side. This is the gateway to the high desert country north of Shasta. The mountain looms at every vantage point in this historic lumber town. One of my favorite stopovers en route to Weed is the Living Memorial Sculpture Garden, created by Vietnam vet and sculpture artist Dennis Smith. Located on a starkly beautiful landscape with Shasta as a backdrop, this series of huge metal sculptures evokes a powerful sense of homage and peace. It is the finest memorial to the Vietnam vets I've ever experienced. Outdoor adventures near Weed are similar to those of the other Shasta towns, with the addition of three new activities: windsurfing on nearby Lake Shastina, exploring the Pluto Ice Caves a few miles north of town, and relaxing in a delightful mineral bath at Stewart Mineral Springs, northwest of Weed. With its four interesting base towns, you'll find yourself wanting to return to Mount Shasta again and again. Hardly a winter or summer passes when I havent steered myself here, and each visit has revealed new facets of the fabled mountain region. Click here for details to plan your own trip to California's Mount Shasta.